Shootout At Texas Car Dealership Leaves 3 Dead : The Two-Way Two bounty hunters and the fugitive from Minnesota that they were tracking were killed Tuesday night in a shootout at an auto dealership in Greenville, Texas, authorities say. A video of the shooting was released to reporters by the city of Greenville, Texas. Warning: A quick succession of gunshots can be heard on the video but no graphic aftermath is shown. Customers and employees were diving for cover Tuesday night at the Nissan dealership in Greenville, Texas. Two bounty hunters and the fugitive from Minnesota that they were tracking exchanged gunfire. Twenty shots were fired in about six seconds, according to a statement from Kathy Lucas, a spokeswoman for the city. In the end, the two bounty hunters, Fidel Garcia Jr., 54, and Gabriel Bernal, 33, as well as fugitive Ramon Michael Hutchinson, 49, were killed. 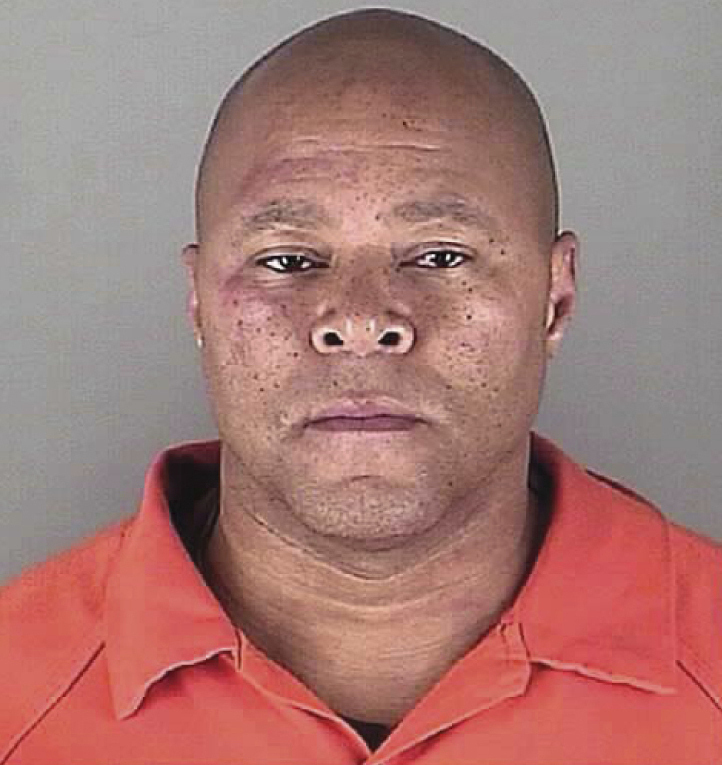 Hutchinson was facing several charges that included assaulting a law enforcement officer. Ramon Michael Hutchinson, shown in the photo provided by the sheriff's office in Hennepin County, Minn., and two bounty hunters were killed during a hail of gunfire at a Texas car dealership Tuesday night. According to news reports, the bounty hunters arrived at the dealership, which is about 50 miles northeast of Dallas, earlier in the day and waited hours for Hutchinson to show up. It wasn't immediately clear why Hutchinson had come to Texas from Minnesota. The city of Greenville released video of the shooting to reporters on Wednesday. The Dallas Morning News reports the video shows two armed men cornering a third man in a glass office at the dealership. As the men scuffle, gunshots ring out in quick succession. The men fought as Hutchinson retrieved his weapon and began firing. The other two fired as well. All three received multiple gunshot wounds and died at the scene, authorities say. No one else was struck by gunfire. "We were all very relieved that none of our employees or customers were hurt," the dealership's owner Rick Ford told KDFW TV. "We can replace the glass; we can replace the furniture."